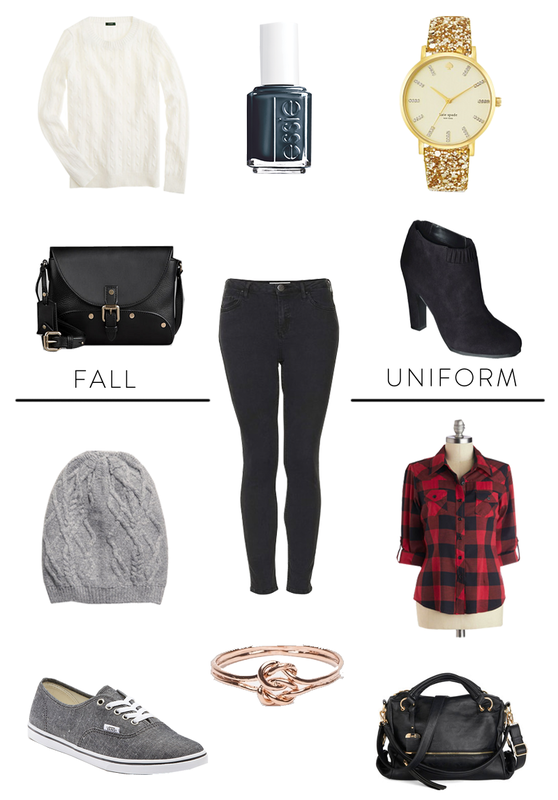 And so the fall appreciation rolls on here on the blog with my fall uniform. Well in this case uniforms. Cold weather is my favorite weather. All of my clothes, in my opinion, are much more stylish. What can I say I love a good jumper. So much I’ll even wear light ones in the summer too because oh well. Not everyone can be confident in tiny summer fashions, right? So shown above are takes on two of my current favorite go to outfits. These items are much better than ones in my actual (sensibly priced) outfits, but that’s probably because with online browsing budgets never matter. (Most of these items are still reasonably priced) Sadly the real world doesn’t match up with this philosophy even though it should. I think we can all agree on that. Nevertheless the outfits are very similar to the ones I can be found wearing any given day of the week with a few minor additions such as a coffee cup. That’s an accessory right? No. I know it’s not. Truth be told I was a bit skeptical of booties but I’ve always wanted some. I’m probably one of the clumsiest people on the face of the Earth. Seriously, I just found another magical bruise and can’t recall which instance may have caused it. I tried on countless pairs but it seems flat ankle booties are my only savior. Who wants to look like a newborn giraffe learning to walk while trying to maintain some form of confidence in a cute outfit? I feel utterly ridiculous talking about this, so on to the shopping links. Posted in Fashion and tagged Collection, Fall, Seasonal, Shopping, Women's Apparel on November 8, 2013 by coffeeandwinter.